Max Weinberg is showing little sign of preparing to hang up his sticks and enjoy a well-earned retirement. The E Street Band drummer has spoken to Kansascity.com about the last decade backing Bruce Springsteen and his time as bandleader for US chat show host Conan O'Brien's house band. Speculation is rife stateside as to whether Max will continue in the latter role after O'Brien's show moved to a new station. Max said: "I live in New Jersey, and they film in California. I assume they're mounting a whole new production and concept. So the most definitive thing I can say to anyone interested in Conan and myself, just stay tuned. "I want to keep drumming. I've had ten years of fantastic reuniting with Bruce and the E Street Band. I look forward to doing that again. TV was great. It was unfortunate the way it ended, particularly for Conan. I don't regret a day playing on television. For all those years, I had the best of both worlds. 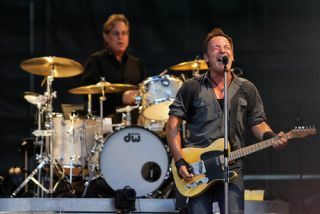 My thing is to relax and to play drums with this big band and to continue to play with the E Street Band and Bruce." Check out why US audiences are so keen to see Max reunited with Conan in the clip below.